Buddhist View of Interdependence – Alan Watts | Creative by Nature. “The Buddhist principle that “form is void” does not mean that there are no forms. It means that forms are inseparable from their context- that the form of a figure is also the form of its background, that the form of a boundary is determined as much by what is outside as by what is inside. The doctrine of sunyata, or voidness, asserts only that there are no self-existent forms, for the more one concentrates upon any individual thing, the more it turns out to involve the whole universe. The final Buddhist vision of the world as the dharmadhatu– loosely translatable as the “field of related functions”- is not so different from the world view of Western science, except that the vision is experiential rather than theoretical. 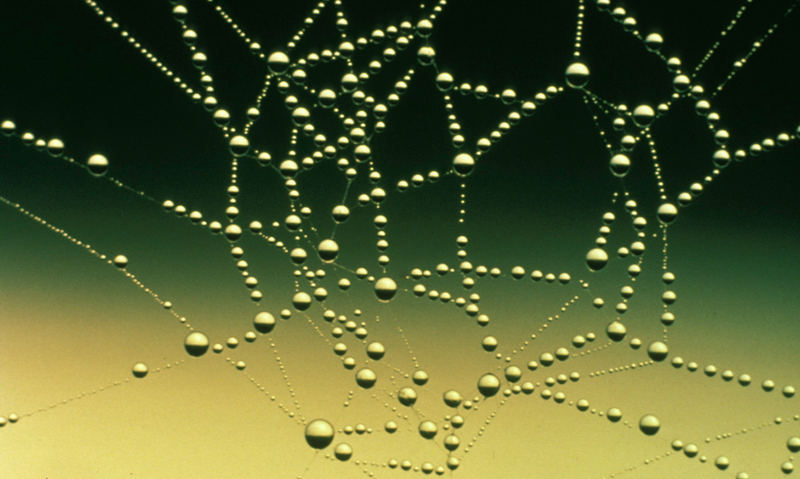 Poetically, it is symbolized as a vast network of jewels, like drops of dew upon a multi-dimensional spider web. Looking closely at any single jewel, one beholds in it the reflections of all the others. The relationship between the jewels is technically called “thing/thing no obstacle” (shih shih wu ai), which is to say that any one form is inseparable from all other forms. In sum, then, the Buddhist discipline is to realize that anguish or conflict (duhkha) arises from the grasping (trishna) of entities singled out from the world by ignorance (avidya)- grasping in the sense of acting or feeling toward them as if they were actually independent of context. This sets in motion the samsara or vicious circle of trying to solve the false problem of wresting life from death, pleasure from pain, good from evil, and self from not-self- in short to get one’s ego permanently “one up” on life. But through the meditation discipline the student finds out that he cannot stop this grasping so long as he thinks of himself as the ego which can either act or refrain from action. The attempt not to grasp rests upon the same false premise as the grasping: that thinking and doing, intending and choosing, are caused by an ego, that physical events flow from a social fiction. The unreality of the ego is discovered in finding out that there is nothing which it can either do or not do to stop grasping. This insight (prajna) brings about nirvana, release from the false problem. But nirvana is a radical transformation of how it feels to be alive: it feels as if everything- including “my” thoughts and actions- were happening of itself. There are still efforts, choices, and decisions, but not the sense that “I make them”; they arise of themselves in relation to circumstances. This is therefore to feel life, not as an encounter between subject and object, but as a polarized field where the confrontation of opposites has become the play of opposites. It is for this reason that Buddhism pairs insight (prajna) with compassion (karuna), which is the appropriate attitude of the organism to its social and natural environment when it is discovered that the shifting boundary between the individual and the world, which we call the individual’s behavior, is common to both. My outline, which is not just the outline of my skin but of every organ and cell in my body, is also the inline of the world. The movements of this outline are my movements, but they are also movements of the world- of its inline. “According to relativity theory, space is not regarded as a container but as a constituent of the material universe.” Seeing this, I feel with the world. By seeing through the social institution of the separate ego and finding out that my apparent independence was a social convention, I feel all the more one with society. Corresponding, then, to the final vision of the world as a unified field (dharmadhatu), Buddhism sees the fully liberated man [person] as a Bodhisattva, as one completely free to take part in the cosmic and social game. When it is said that he is in the world but not of it, that he returns to join in all its activities without attachment, this means that he no longer confuses his identity with his social role- that he plays his role instead of taking it seriously. He is a Joker or “wild” man who can play any card in the deck. 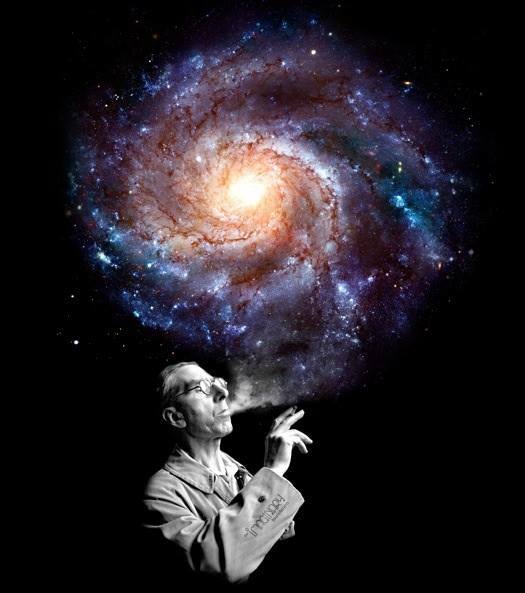 You are a Part of the Cosmic Whole – Erwin Schrödinger | Creative by Nature.